York General Sleep Studies provides overnight sleep testing close to home for individuals who may be suffering from a sleep disorder. 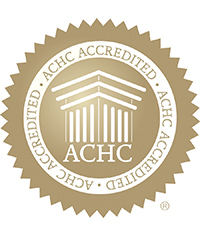 Our Sleep Study Department is accredited by the Accreditation Commission for Health Care (ACHC), which found that the York General Sleep Studies program operates at a level of quality, integrity, and effectiveness consistent with ACHC standards. York General Sleep Studies are performed in a two-unit sleep lab area at the West View Medical Building. A private home-like atmosphere has been created in each unit with a large, comfortable bed and a restful decor. While the individual sleeps, the sleep technologist monitors and records his/her brain waves, breathing, heart rate, activity, etc. from another room. The recording is reviewed by a physician trained in sleep study interpretation. The physician’s report is sent to the ordering medical provider, who discusses the results with the patient and recommends any treatment that might be needed. If left unidentified, common sleep disorders can cause various medical problems. Common symptoms of sleep disorders include sleepiness during the day, sleepiness even after 8 hours of sleep, loud snoring, violent behaviors during sleep, or a near-miss accident caused by drowsiness or falling asleep. All sleep studies require medical orders from a medical provider. Sleep Studies is located at West View Medical Building, 2319 N Lincoln Avenue, York, NE.